Mary “Polly” Futch and John Webb were the parents of John Thomas Webb, and the grandparents of previous subjects, Shellie Lloyd Webb and William Crawford Webb. Mary Futch was a sister of Rhoda Futch. John Webb and Mary Polly Futch. Image courtesy of Jimmie Webb. Mary “Polly” Futch was born October 14, 1842 in Lowndes County (now Berrien) Georgia. She was a daughter of daughter of John M. Futch and Phoebe Mathis. On April 21, 1859 in Berrien County, Georgia she married John Webb, a landowner and planter of Berrien County, GA. John Webb, a son of Dawson Webb and Frances Beall, was born January 22, 1834 in Wilkinson County, Georgia. Marriage Certificate of John Webb and Mary Futch, April 21, 1859, Berrien County, GA. Image courtesy of Jimmie Webb. To any ordained Minister of of Gospel, Judge of the Superior Court, Justice of the Inferior Court, Justice of the Peace or any person by the laws of this state authorized to celebrate: These are to authorize permit you to join in the Honorable State of Matrimony Mr. John Webb of the one part and Mifs Mary Futch of the other part according to the constitution and laws of this State and according to the Rites of your church; Provided there be no lawful cause to obstruct the same and this shall be your authority for so doing. 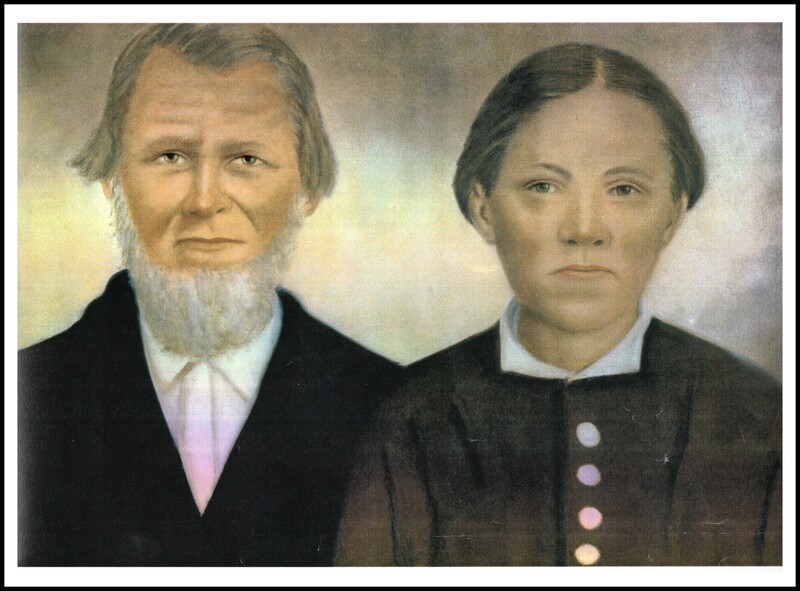 Reubin Futch, J. I. C.
The census of 1860 enumerates 26-year-old John Webb and 17-year-old Mary in Berrien County. John was a farmer with $1200 dollars worth of real estate and $450 worth of personal property to his name. According to the census neither John nor Mary could read or write, but later records would show he could at least sign his name. Enumerated near the Webbs were John & Elizabeth Baker, and Isham Clyatt. The following spring,1861, Georgia plunged into the Civil War. By November 1861, Federal troops made their first invasion of Georgia, occupying Tybee Island with designs on Fort Pulaski and Savannah. That winter, John Webb joined the Primitive Baptist congregation at Pleasant church, located a few miles west of his farm. 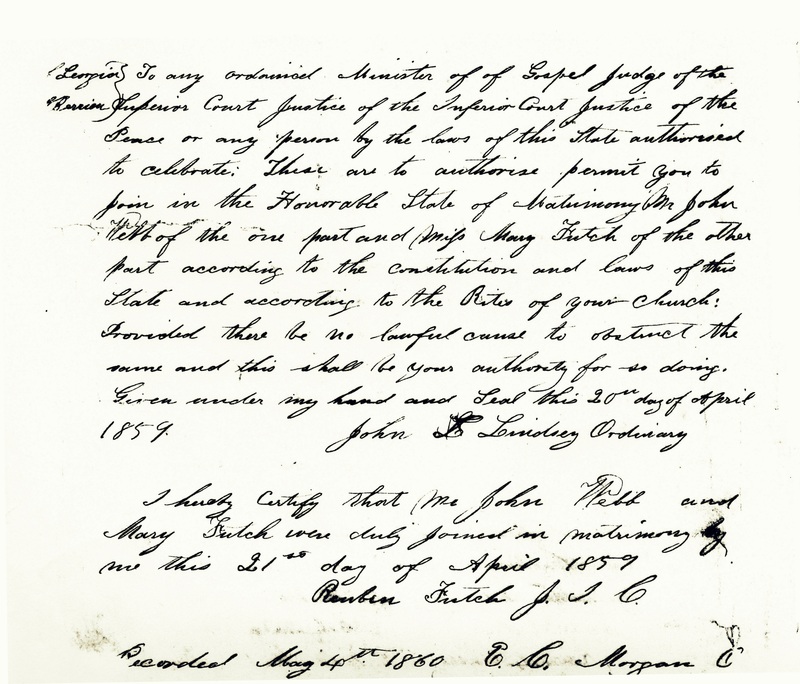 According to church minutes, John was baptized at Pleasant Church on January 1, 1862. During the War, John Webb enlisted in Company E, 54th Georgia Regiment, along with his brother Jordan and other men of Berrien County. John went off to fight leaving Mary on the farm with a baby on her hip and another on the way. He fought with the 54th Regiment throughout the war, although he was on furlough home at the time of their surrender in April of 1865. That October, perhaps in observance of John’s safely reaching the conclusion of the war, Mary Webb joined with Pleasant Primitive Baptist Church. Church minutes show she was baptized October 14, 1865. Like other men of Berrien County, after the war John Webb swore an oath of allegiance to the United States and to faithfully support the Constitution, and returned to his farming. According to 1867 Berrien County tax records, John Webb owned all 490 acre of land lot 410, 10th Land District. His brother, Jordan Webb, owned 245 acres on the adjacent lot, 419. To the north, William Walters owned 612 acres on lots 373 and 374. Also on Lot 373 were John Ray, with 122 1/2 acres and David S Robinson with 60 acres. Parts of lot 418 were owned by Mary DeVane and Benjamin M. DeVane owned additional 525 acres of land on lots 418 and 419. John Baker was on 122 acres of lot 419. The census of 1870, indicates the Webbs were getting by in the post-war period. Their land had a aggregate value of $2800, they had $754 in personal property, and now four young children. By 1876 John Webb had acquired 1560 acres in lots 372, 409, and 410 in the 10th Land District. He owned $200 in household furniture, $454 in livestock,and $90 in plantation and mechanical tools. The following year, 1877 John Webb had acquired all of lots 372, 409, and 410, 1470 acres in all. He had $150 in furniture, $335 in livestock, and $80 in tools. His wife, Mary Futch Webb had 180 acres in her own name in Lot 373, with $265 in livestock. To the south of the Webb place, on half of lot 419, was William Henry Outlaw, a Webb descendant on his mother’s side and a fellow veteran of Company E, 54th Georgia Regiment. Among the Webb’s other neighbors were David M. Roberson with 212 acres of lot 365 and David S. Roberson with 550 acres on parts of 373 and 364. William Walters was on Lot 374 and David J. McGee had 395 acres on lots 408 and 411. Miller F. DeVane and George M. DeVane with 165 acres each on 411 and 412. Mary DeVane had 7 acres on 418, Michael B. DeVane with 500 acres on 418 and 419, William DeVane on parts of 418, John Baker on 172 acres of 419. The 1880 census shows the Webb family continuing to grow. The Webb sons, John Thomas and James, at least, were “at school”. In 1890 John Webb had 1000 acres total on lots 372, 373, and 410 valued at $1500. From 1883 to 1890, a neighbor to the north was Noah Webster Griffin and his family on lot 371. John Webb’s son, John Thomas Webb was on 200 acres of the neighboring lots, 408 and 409. Son-in-law Malachi W. Jones was on 490 acres that included parts of 409 and 420, and son-in-law Joel J. Carter had 140 acres of lot 372. Elizabeth J. Carter had 240 acres on lots 365 and 366. George W. Carter had 40 acres straddling 364 and 365. Isaac S. Weaver was on 375 acres that included parts of 418, 419, and 411. John Ray was on 245 acres of 373, and Thomas W. Ray was on 125 acres of lot 364. Aaron A. Knight had 155 acres that included part of lot 374. Sovin J. Knight was on 365 acres of 364 and 365. The Devane land to the south was now in the possession of Georgia R. DeVane. George M. DeVane and Millard F. DeVane had the land to the west o Lots 411 and 412. William E. Fountain Jr. was on Lot 365 with 147 acres. H.H. Green had a piece of 364. According to Shaw Family Newsletters, on November 5, 1898, Mary and John Webb deeded 350 acres in section 412 of land district 9 (presently under water at the southwest end of Boyette’s Pond in Cook County) to daughter Luannie Webb as a wedding gift. She had married Chester D. Shaw earlier that year. John Webb died December 15, 1900 in Rays Mill, GA (now Ray City). He was buried in Futch Cemetery in present day Cook County, GA.
Martha Mary Webb, b. April 10, 1861, Berrien County, GA; d. January 30, 1929, Berrien County, GA buried in Pleasant Church Cemetery; m. (1) Joel J. Carter, January 27, 1878, Berrien County GA; m. (2) William W. Parrish, August 10, 1899, Berrien County GA.
John Thomas Webb, b. January 15, 1863, Berrien County, GA; d. March 16, 1924, Ray City, GA buried in Pleasant Cemetery; m. Mary Jane “Mollie” Patten, November 2, 1882, Berrien County, GA.
Frances “Fannie” A. Webb, b. May 6, 1866, Berrien County, GA; d. October 3, 1909, Adel, GA buried in Woodlawn Cemetery, Cook County, GA; m. Malachi “Mallie” W. Jones, December 24, 1885, Berrien County, GA.
Phoebe Jane Webb, b. May 23, 1869; d. October 10, 1870. James Alfred Webb, b. July 03, 1871, Berrien County GA; d. September 30, 1938, Berrien County GA; m. Pearl “Pearlie” Register, January 18, 1894, Berrien County, GA from Marriage Certificate. Mary Delann Webb, b. November 1, 1873; d. February 13, 1879. Luther Americus Webb, b. October 5, 1875, Berrien County, GA; d. April 30, 1909, Berrien County, GA, buried in Pleasant Cemetery, Berrien County GA; m. Mary Jane Albritton, January 24, 1897, Berrien County, GA from Marriage Certificate. Leona Webb, b. 1877, Berrien County, GA.
Louannie T. Webb, b. August 7, 1880; d. June 8, 1902, Lenox, GA from Typhoid Fever, buried in Pleasant Cemetery; m. Chester D. Shaw, March 16, 1898, Berrien County Georgia from Marriage Certificate. Mrs. Mary Webb, widow of the late John Webb, died Wednesday evening at 7 o’clock at the home of her daughter, Mrs. Martha Carter, Ray City, after a short illness. Mrs. Webb was eighty-three years of age and until she suffered from an attack of flu, four or five days ago, had been in her usual good health. However, owing to her advanced age, she was unable to withstand the attack. Her husband preceded her to the grave twenty-six years ago and she has since made her home with her daughter, Mrs. Carter. Besides Mrs. Carter, she is survived by one son, Mr. J.A. Webb, of Ray City. The deceased was one of the pioneers of her section, and the family is well and favorably known throughout all of this section. Mrs. Webb was for more than 60 years a consistent member of the Pleasant Primitive Baptist church, near Ray City, and during her days of activity, was famed for her kindly acts and generous disposition, and her death brings great sorrow to her friends and those of the family. In addition to the surviving son and daughter, Mrs. Webb leaves thirty-five grand children. The funeral services were conducted this afternoon at 3:30 by Rev. Mr. McCranie at the Futch cemetery, near Ray City. Special thanks to Jimmie Webb for contribution images and portions of the content for this article. All your posts are interesting, but this one was esp. so since it was personal. You mentioned the Webb connection to my greatgrandfather and namesake WHH Outlaw. From another direction, John Webb was my 3d greatgrandmother Sutton’s brother. (That makes me more Webb than most Webbs. 😉 ) William Elbert Fountain also married one of the Webb girls, and was brother of my 2d greatgrandfather Fountain. One, Nancy, of their sisters married David S. Robinson (note spelling) and another, Mary, married Billie Walters (or Waters or Watters). There’s more. It’s a small world.